Knockdown is our most requested texture. Most new homes have a medium or light knockdown texture. 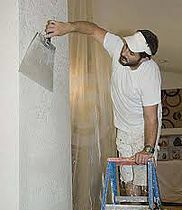 A spray texture is applied and “knocked down” with a clean wide knife (or trowel) to create the desired effect. By varying the amount of texture applied and the pressure used during the knocking down process, knockdown texture can be varied from light to heavy, with Medium Knockdown being the most common.